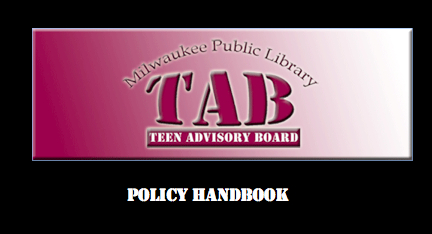 Before the 2011-2012 school year began, the Teen Advisory Board (TAB) coordinators decided that we needed to start the year with a clear policy manual. In the previous year, there had been confusion over the specific roles of the various officers, as well as the general requirements for TAB credit. What were the responsibilities of each office in particular, and officers in general? How many hours did a TAB member have to contribute during the year to be considered an active member? What policies currently existed, where on earth were they, and how did the teens find out about them? We saw that having policies laid out would help our teens succeed, and ensure that the work did not fall entirely on a dedicated few. Furthermore, having clear policies would help the teens to be more innovative. Knowing their budget, their boundaries, and their options would allow them to truly lead their own organization, with librarians as advisers and guides. Clearly, I believe in the importance of having up-to-date, clearly communicated policies. They are not limits, but encouragements. They give those to whom they apply - whether TAB members or staff members - a sense of control and understanding that is critical to leading from within, and to feeling a sense of belonging to the organization. As an example of my policy-writing, you can view my original version of the TAB Handbook.